But it seems that you're already following those! Regarding the interface, if it's not too much to ask from Craig, it would be nice if both options could be chosen (fixed position and auto-position). But apart from the personal preferences, that may not be a crucial thing in game-play. After some turns we'll probably end up getting used to either way of placing the interface. 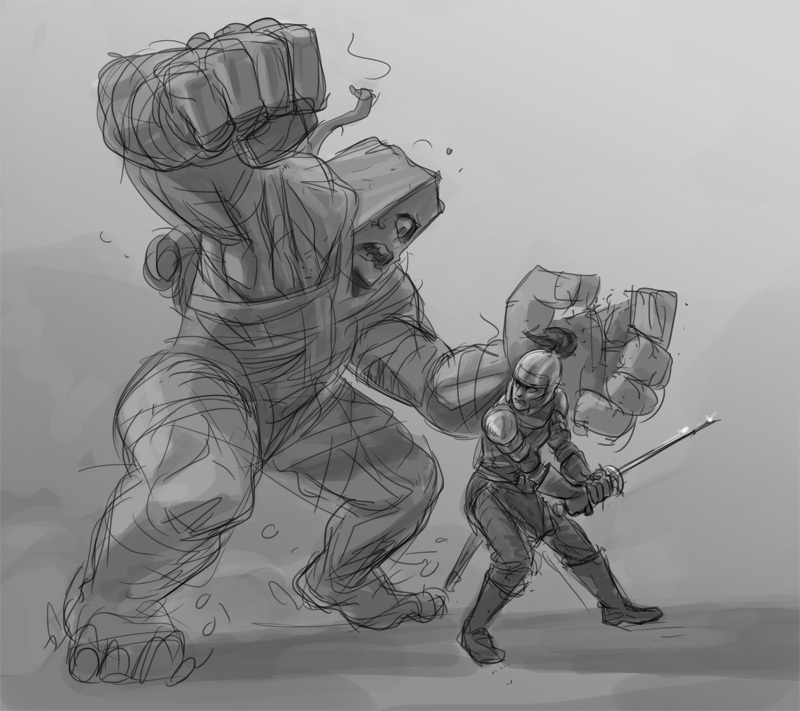 The golem vs swordsman is a great image! I really liked it. Craig: There is a colour code, named ColorADD designed to help colour blind people. It may also be interesting to take a look at Color Oracle that is a colour blindness simulator. I'm not seeing exactly how to fit both things into TT, but it still may be interesting for future reference. I too played the demo and immediately pledged. I think the unit interface is pretty good in showing your available actions and unit stats, so i've got no complaints there. seems like a sollid tactics type game. I'd prefer combat didn't automatically end, since I like bashing all the barrels and such (unless the gold auto loots and the items don't carry over, in which case it's truly pointless). I don't have access to the full game, but the assassin in the demo seems CRAZY strong. can one hit guys, leap, and seems to dodge everything throw back at him/her. the enemy AI also doesn't seem to act very cohesively as a team, so it's pretty easy to split them up and pick them off. anyways, i appreciate what i've seen, and look forward to seeing more - thanks! Wartman--that art is totally awesome! I am totally going to share that, if you don't mind. Thanks for the feedback! The assassin is quite strong in the single player demo campaign mainly because the enemies in that campaign are relatively weak; if you play Local Matches, where the teams are evenly matched in terms of stats, I think you'll find that Assassins are more balanced. They are actually really bad against most front-line fighters, which get physical resistance and a counterattack. They are also easy to finish off with Mental attacks (since those can't be dodged). Yeah, in the demo level the assassin has lots of soft targets to pick off and plenty of room to maneuver, plus she outlevels most (all?) of the opposition. Yes; at present, enemy level does not have any actual effect on enemies or on experience gained. (1) Backstab damage. Not having other characters to watch your lone fighter's back will automatically put him/her at a big disadvantage. (2) AI. You can't just send out a single over-powered character to attract enemies one at a time. Enemies will actively pursue your weakest characters, so you're making things much harder on yourself if you deliberately keep most of your characters weak. (3) Defense is percentage-based, not directly arithmetical. You're never going to see something like the notorious "No Damage!" pop-up from Fire Emblem unless you both seriously overlevel and somehow manage to get resistance stat gains every single time. (4) Even if you do manage to get close to 100% resistance in an element, this isn't a game where you just have Defense and Resistance; in Telepath Tactics, getting (for example) 90% slash resistance means there are still something like a dozen other elements where you character won't have resistance! The AI is smart enough to rely on attacks that your characters don't resist, so at best, your character will take minimal damage from only some of the enemies present. In short: this isn't Fire Emblem. You can get a really damn powerful character through overleveling, sure, but that character is unlikely to successfully solo a battle--and in the meantime, your other characters are going to drop like flies. That, at least, is what I predict. I could be wrong. Makes perfect sense. My impression playing the demo was also that I didn't see any particular advantage to be gained by overleveling a character. Along with your points, the variety of tactical situations and possible opponents should incentivize spreading out the experience among members of different classes. My apologies if this has already been addressed in detail, but: would it be possible to set up a custom campaign so you can move between campaign levels freely and nonlinearly, without getting stuck going down any branches, and your position being determined in part by what map you were in before? Yup! You can absolutely do that via scripting. When creating a new attack, if it isn't of the element Create, the game now takes whatever you put in the creates attribute as a sign of what you'd like to replace the attack's target with if it dies. My wishes have come true!!! From the same post, I believe I see why my "Undead Swordsman" characters weren't getting their names properly when I modded them in. Silly me. Can an item give a one-time use attack? Not yet. I've just added equipment into the game, however, which will give characters granted attacks for so long as the equipment remains equipped.